The M.ZUIKO DIGITAL ED 60mm f/2.8 Macro Lens from Olympus is a Micro Four Thirds lens compatible with the PEN series of interchangeable-lens digital cameras. 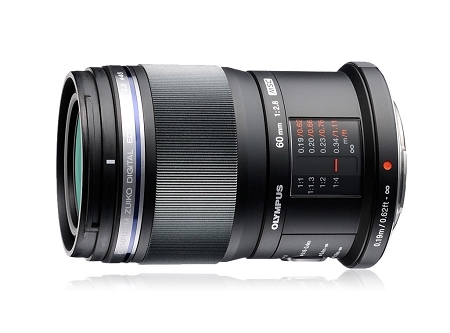 It is a prime lens with a fixed focal length of 60mm (35mm equivalent: 120mm) designed for sharp close-up shooting. The wide, fast f/2.8 maximum aperture creates a shallow depth of field and improves image quality in low-light conditions. The much narrower minimum aperture of f/22 creates greater depth of field and is useful in brighter conditions. The lens' aperture is controlled by a 7-blade circular diaphragm. The maximum reproduction ratio is 1:1, and you can focus as close as 7.4" (18.8 cm).